But back to the bunting. 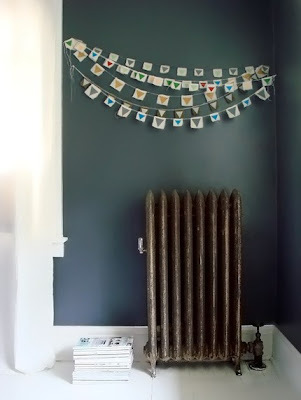 It was cute actually -- falling apart and totally wonky, but it made me want to hang something more permanent in that spot (something perhaps exactly like the little gold "bunting" above), as I think every once in a while you have to throw all caution and convention to the wind and hang random things in inappropriate spots in your house. And speaking of happy, I’m still fighting the blues, but I can report that I've put things in perspective, which is the starting point for getting out of any rut, no? So a dose of perspective, a little random bunting + the following are collectively joining forces in making me happier today. Three new magazines arriving in the mail yesterday + two girlies that went to bed early enough last night that I actually had some time to flip through them. It’s the small things friends. "every once in a while you have to throw all convention to the wind and hang random things in inappropriate spots in your house"
I love magazines! What ones did you get? These days looking forward to sitting down with a drink and a magazine gets me through the day. The little things are really the most reliable source of happiness. You have no control over many events in your life, but you can always make yourself the perfect cup of tea and give yourself 5 minutes with a beautiful magazine. Or whatever works for you. I'm enamored. Thank you for sharing this adorableness. You know what made me so happy today? To see the different angle that the sun has in the autumn sky. I hope where you are you can see it too and find some joy from it! Hope those blues turn into vibrant oranges and dashes of red with sparkles of silver! jane -- you have never failed me with your advice ;-) thank you...i will be counting down the days until october. I'm quite liking Jane's pearls of wisdom regarding September! 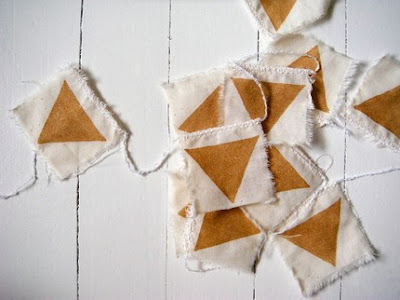 i have recently fallen COMPLETELY in love with "bunting" or "happy garland" as i like to call it! i love this so much!! Yes, it is the small things. Quiet time with your magazines can be quite healing. And I love the bunting idea in an unexpected location. *phew* I just caught up on a few weeks' worth of posts and I finally feel back in the "loop". Sorry to hear you were feeling a little down and out, and hoping it's passed and you're feeling better. i say let fall pull you out. there's something about the the light and air that always makes me want weep with happiness. Even when it's 93 degrees at the beach in LA. The light has changed and that's almost enough for me. Also, i'm so with you about the bunting. I'm thinking of making a strand over the weekend to send as a baby present. it doesn't look that hard? I think I have a blog crush. I just spent a good chunk of my work day looking through your posts. Thank you for reminding me why I love reading blogs so much! PS: I found you from my etsy store google analytics but can't seem to figure out why. hm. Oh wow, what a nice surprise!! Thank you so much for featuring my garlands, I appreciate it so much! oh, i love bunting and garlands! i just bought some of the japanese masking tape in the 6 color pack and the graph paper. it's so lovely! plus they have tape dispensers, a wood one and a muji acrylic one. i was going to do a post about it soon. kate -- thanks for the tip...what a lovely christmas gift some of that japanese masking tape and a little acrylic dispenser.